Even though it's been out overseas for quite some time, OGPlanet has decided to finally bring the Gears of War-style third-person shooter, Dizzel, to North America. The free-to-play game has recently entered open-beta testing, giving gamers a free way to get in their desire to partake in third-person, multiplayer gameplay similar to Epic Games' ultra-violent shooter. Players can utilize cover-fire and blind-fire tactics, rolling, melee attacks and even kill moves that include dynamic fatalities on near-dead opponents. One of the neat modes in the game is playing the Sentinel mode, where a group of players will take on prime-time, robotic killing machines. You can see some snippets of gameplay in action with the beta trailer below. Originally, Dizzel had appeared on the market way back in 2009, when it was announced as a free-to-play title. Running on the Vision Engine, Dizzel disappeared from the market spotlight for a long time before recently returning under the OGPlanet label. The game looks like it packs a decent punch to be a free-to-play title and will likely be a pretty good way to get in some quick kills with a few friends. I'm sure a bunch of people feel silly for having to read through all the text above, because they likely clicked the link just to get to the good bits about getting a free weapon. So here are the instructions on how to retrieve the free, golden SIG 552. The codes are only viable until September 10th, 2014. The codes are limited to one use per account. Of course, before you can use a redemption code you actually need a redemption code. So how and where do you get one? Well, we'll be handing out free redemption codes in packs of 10 on the official Gaming Blend Facebook page. 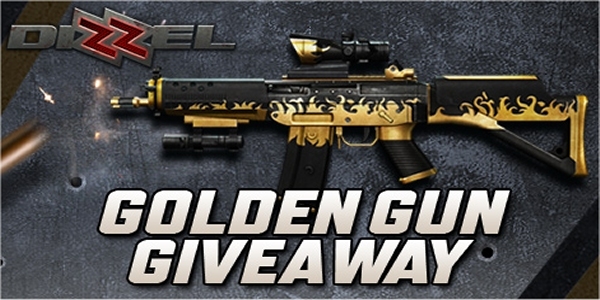 If you want a free SIG 552 with a golden livery, you'll be able to easily get your hands on one by simply clicking on the link, getting a hold of a redemption code and then following the instructions above. For anyone else simply interested in playing Dizzel you can grab the game, for free, from the official website.